Are you lost? Not sure what 'lof' is all about? Visit the Help page! Welcome to our site! If you find something you really like, please let us know just how much by clicking on the love heart icon (we like encouragement ^_^). 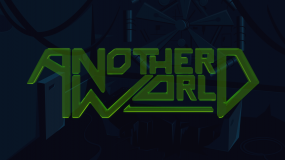 Here's a piece of fan art based on Another World's logo type that I created in Blender for my nice, long, long, long, long article on the game. The backdrop is another piece depicting Lester's lab that was done in Inkscape. These links will take you to a selection of some of our better art! There are plenty more scribbles and works in progress that you can find by clicking on the Artwork tab. twolofbees.com exists so that we can share our drawings, scribbles and other creations with the world. Click here to check them out. We get some great feedback from our visitors. Click here to see what's been 'loved' most, and don't forget to click the heart icon for things you like! If you're still looking for a way to get started, here are some tags that group some of our favourite themes and recurring elements. Here are some of our favourite comics and stories that we've done. You can see more by clicking the Comics tab.